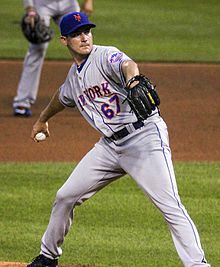 Jacob Seth Lugo (born November 17, 1989), known as Seth and nicknamed Quarterrican, is an American professional baseball pitcher for the New York Mets of Major League Baseball (MLB). He made his MLB debut in 2016. He played for the Puerto Rican national baseball team in the 2017 World Baseball Classic winning a silver medal. Lugo attended Parkway High School in Bossier City, Louisiana, and Centenary College of Louisiana, where he played college baseball for the Centenary Gentlemen. In three seasons with Centenary, Lugo had a 5.31 earned run average (ERA). The New York Mets selected him in the 34th round, with the 1,032nd overall selection, of the 2011 MLB draft. He signed with the Mets, receiving a $20,000 signing bonus. Lugo missed the 2012 season due to spondylolisthesis, which required spinal fusion surgery. After the procedure he was bedridden at his mother's home for three months. He returned to pitch in 2013 for the Brooklyn Cyclones of the Class A-Short Season New York–Penn League and the Savannah Sand Gnats of the Class A South Atlantic League, pitching to a 4–6 win-loss record with a 3.39 ERA in 12 games started. He pitched for the St. Lucie Mets of the Class A-Advanced Florida State League in 2014, and for the Binghamton Mets of the Class AA Eastern League and Las Vegas 51s of the Class AAA Pacific Coast League in 2015. The Mets added him to their 40-man roster after the 2015 season. Lugo began the 2016 season with Las Vegas. The Mets promoted him to the major leagues on June 30. Lugo made his Major League debut against the Chicago Cubs on July 1, 2016, throwing two shutout innings in a victory. On August 25, Lugo recorded his first major league win and hit, throwing five shutout innings against the St. Louis Cardinals at Busch Stadium before exiting with muscle cramps. Following that, Lugo became a key cog in the Mets' injury-riddled rotation, pitching to a 2.67 ERA throughout the season and finishing with a 5–2 record. Lugo would have been the second or third starter for New York in the postseason had the Mets advanced past the Wild-Card Game. Entering the 2017 season, Lugo was expected to provide depth the Mets' pitching staff. After injuries to other starters, Lugo found himself battling with Robert Gsellman for the final spot in the Opening Day starting rotation. However, Lugo himself would be diagnosed with a partial tear of the ulnar collateral ligament in his pitching arm after competing for Puerto Rico in the 2017 World Baseball Classic. The injury would cause him to miss the first two months of the regular season. He returned to make his first start of the season for the Mets on June 11, 2017 against the Atlanta Braves, getting the win after pitching seven innings of one-run ball. On Saturday July 15, 2017 Lugo hit his first major league home run against the Colorado Rockies. On August 15, Lugo was again placed on the disabled list with an impingement in his pitching shoulder. Lugo chose to honor his paternal grandfather, who was Puerto Rican, by playing for the Puerto Rican national baseball team in the 2017 World Baseball Classic. He was the starting pitcher against Venezuela in the first round, against United States in the second round and in the championship game. He won both the first and second-round games. In the Championship Game, Lugo did not have the same luck on the mound as Puerto Rico lost, 8–0. Lugo and Amanda Vogle married in January 2018. He is the son of Vicki and Ben Lugo. Seth was the punter for his high school football team, goalie for soccer team and high jump in track and field. ^ "MLB Players Weekend: National League nicknames". ^ Hedges, Russell. "Former Parkway pitcher Seth Lugo a step away from major leagues". Bossier Press. Retrieved June 30, 2016. ^ Wagner, James (July 2, 2016). "After 34 Rounds, Then Five Years, Seth Lugo Makes the Most of Two Innings". The New York Times. Retrieved March 21, 2017. ^ Guilbeau, Glenn (February 25, 2017). "Shreveport's Seth Lugo is Mets' Sidd Finch — no fooling". USA Today. Retrieved March 21, 2017. ^ "The unlikely story of Seth Lugo: The Mets pitcher who turned into major league prospect (VIDEO)". NJ.com. Retrieved June 30, 2016. ^ Rubin, Adam (August 24, 2016). "Seth Lugo, once bedridden for three months after spinal surgery, pitching in for injury-riddled Mets". ESPN. Retrieved August 30, 2016. ^ "Mets protect four players from Rule 5 Draft". MLB.com. Retrieved June 30, 2016. ^ "Mets to promote righty Seth Lugo from Triple-A Las Vegas". ESPN.com. Retrieved June 30, 2016. ^ "Ex-Parkway, Centenary standout makes MLB debut". Shreveport Times. July 1, 2016. Retrieved July 2, 2016. ^ Ackert, Kristie (August 25, 2016). "Lugo leaves with injury as Mets hold on for win over Cardinals". New York Daily News. Retrieved August 26, 2016. ^ a b Harper, John (August 16, 2017). "Mets place Seth Lugo on 10-day DL, activate Robert Gsellman". Daily News. Retrieved August 16, 2017. ^ Thornburg, Chad (February 8, 2017). "Young stars join Beltran, Yadi for Puerto Rico". MLB.com. Retrieved March 14, 2017.